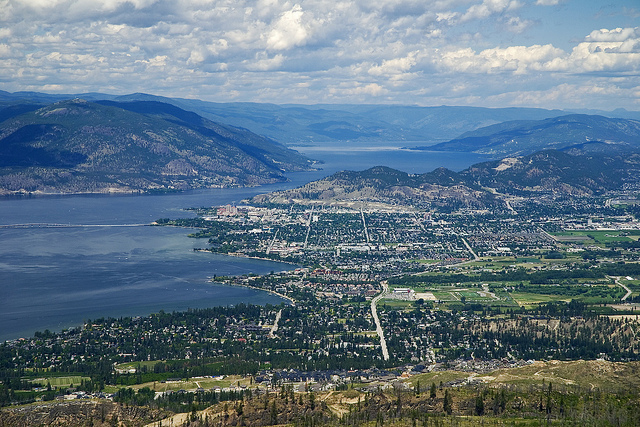 Situated four hours north of Vancouver, Kelowna is nestled between stunning coastlines and expansive mountain ranges. The city is lesser known to those unfamiliar with Canada as a whole but it is a real tourist hotspot for those seeking something different. By combining glorious natural beauty and a booming downtown district it’s really no wonder why. So here I’ve put together seven reasons why you should absolutely visit this jewel of British Colombia. The 82-mile-long Okanagan Lake offers some outstanding resorts but none are more attractive than the Kelowna hotels and resorts. From modest budgets such as the Day’s Inn to 5 star luxuries such as the gorgeous outback resort which offer spa and massage treatments. Wherever you stay you can enjoy lavish service while never being more than a stone’s throw away from outstanding views. Kelowna has developed a reputation for world-class wineries over the last few decades with over 25 boasting trophies and awards from international wine competitions. Many of the wineries here bottle their product lovingly by hand with tasting sessions on offer at all of them. To get the full experience there are a number of tour operators that will guide you through the rich history and even richer landscapes as you learn and experience the full beauty of the regions famous tipples. The culture of Kelowna is deeply rooted in agriculture and the people here really hold the regions flora close to their heart. Exploring one of the many orchards here is an absolute must and every orchard is nurtured and loving looked after by its owners. A must see is the 150 acre Kelowna Land and Orchard which features the award-winning gourmet restaurant, The Ridge. Kelowna has miles and miles of beautiful Greenland, sandy beaches and lake water. Its rolling hills, endless waterways, vineyards, orchards and cityscape make for some awesome golf courses. There are over 19 golf courses to be played in Kelowna offering a skill level for everybody. With over 2000 hours of sunshine per year it’s one of the driest golf seasons around. Stunning panoramic views, endless pine forests and glorious sunshine make Okanagan Lake a breath-taking sight. The waters are clean and clear making them perfect for fishing, boating, swimming, windsurfing, water-skiing or even scuba diving. If you don’t fancy exploring the lake by water there are many trails to be hiked and grasslands to be walked as you take in one of Mother Nature’s finest accomplishments. For any food lover Kelowna sure won’t disappoint. Its markets pride themselves on fresh local produce with vast arrays of food on display such as the open-air Kelowna farmer’s and Crafter’s market where the regions fresh harvest is available for you to explore. In addition to the array of fresh food there are handmade crafts and art work for you to really get a sense of the culture here. Another spot worth visiting is the Carmelis Goat Cheese Artisan where there are over 19 types of award winning cheese to be tried. What’s great about Kelowna is that not only does it provide a relaxed country atmosphere it also offers a bustling downtown district that has really become a star attraction in recent years. There are many bars, restaurants, museums, galleries, nightclubs and events for you to experience during your stay here. Be sure to visit the Rotary Centre for the Arts that regularly host exhibitions of artists, musicians, dancers and actors for your entertainment.